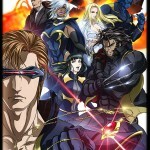 Warren Ellis' "X-Men" Anime comes to the U.S. in English on G4 TV! Emma Frost screencaps in episode 3 of X-Men Anime 2011. Madhouse's X-Men Anime: Emma Frost! Emma Frost (Kaori Yamagata) will appear in Madhouse's X-Men Anime, which is written by Warren Ellis.